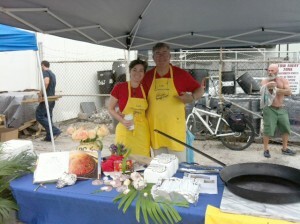 Linda Test, right, and CEO Chris Belland as part of the Los Camerones team. This year in addition to being a sponsor of the Key West Food and Wine Festival, our CEO, Chris Belland, Director of Key West Operations Linda Test and Marketing Director Piper Smith took part in one of festival’s competitions, the Seafood Shakedown, as Los Camerones (The Shrimps). Armed with 20 pounds of shrimp, teams must create a dish using the shrimp that feeds 100 people. 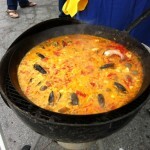 Los Camerones stepped up to the challenge and created three mouthwatering paella’s filled with not only the required shrimp but calamari, lobster, clams, mussels, and mahi-mahi. Missing first place by just a single vote, they vowed to come back next year!